Sathuragiri Hills or Chathuragiri otherwise known as ‘ SUNDARA MAHALINGAM ‘ is situated 10 km from Watrap (Wathirairuppu) near Srivilliputhur. Sathuragiri is the Abode of God. It is otherwise also called as Mahalingam Hill. This is also called as “Siddargal boomi”. 18 Siddhas were used to live here. It is believed that Siddhars still worship Lord Shiva. The Aadi Amavasya festival will be held between August 9 and 12. Devotees trek approximately six kilometres inside the forest from Thaniparai to reach the hill temples. Geomeo Informatics is glad to be part of the Aadi Amavasya festival by introducing the Sathuragiri feature(Offline Content Provider) in the Madurai Kavalan App. Sathuragiri feature got a lot of attraction from the public. 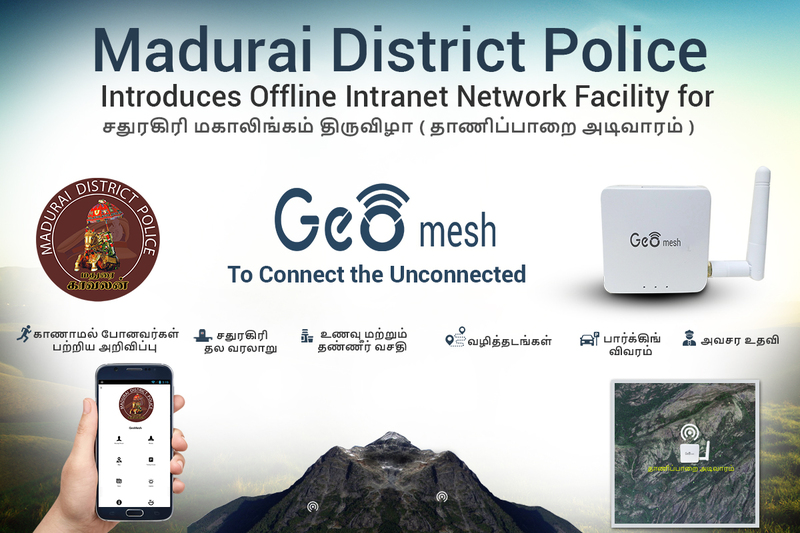 The public has to connect with Geomesh Wi-Fi Router to learn the history of the temple, locate parking lots, emergency helpline numbers, size of the crowd on the hills, and also locations of medical facilities, drinking water and food. Police Department will be able to file the missing person and give announcements to the public.